I want to spar anyone, even if you aren't near my SP level but I would surely rather fight someone near my lowly SP level... lets level each other up and take down the Espada! 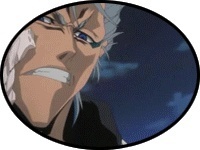 Or take down the Shinigami! Or just kick hiney! Suppose Ser could spar. Just make sure no guys are around with hidden cameras. Can't be having wardrobe malfunctions, now. -Rushes in from getting sewn back up from his last merciless beating at the hands of giftedly endowed women- What? Did I just hear about naked sparring in scented oil?